Once you start working from home you soon start to realise how the home office environment can mean the difference between productivity and time wasting, creativity and bloggers block…. Here’s one I made earlier – what I imagine my home office looks like…. If you work from home, then you’ll understand the importance of your environment and how it can affect your thoughts and level of creativity and inspiration. Therefore, it might be time to spruce up your home office environment so that your blog posts and work will get a new lease of life. Considering how you use the space in the room and on your desk, and how you hope to feel when you’re in there, will help you decide on where to focus your efforts. The following are some tips and ideas for those who want a little inspiration to help them set-up or update a tired and lacklustre office. However big or small your office is; you’ll want to focus on your headspace and how easy it is to relax and work from home in the interior. Light hues and pale colours on the walls and ceiling will instantly freshen up an environment, so it might be worth getting your paint brush and rollers out to cover any old, tired, and dull areas of the room. Your main focal point will be your desk; if you write, blog, and work from home, this will be the area you look and use the most throughout your day. Therefore, you’ll need to ensure you have a surface with enough space and plenty of room for your computer, stationery, and a cup of coffee (or two). If you have a plethora of books, magazines, and accessories; work out some clever storage solutions and keep shelving, drawers, and cabinets a light as possible. Clean, smooth lines and calm colours on your bookcases and desk will allow you to store and display a variety of items without it looking untidy or cluttered, so bear that in mind if you’re heading online or to IKEA to go furniture shopping. You’ll need to ensure that you can hear doorbells, buzzers, and alarms from wherever your office is in your home Therefore, you might need to check out companies like AB Components who can provide you with everything from a piezo transducer to sensors so that you’ll be able to hear every delivery or breach in security. By investing in these elements for your office set-up at home, you’ll be able to operate as any business would in a professional environment. If you work alone at home, you can also have your choice of music all the time, so maybe it’s worth investing in a sound system if you like tunes while you work…. Make sure you’ve invested in great equipment and software so that you can make the most of the latest tech on the market. Remember that the technology is there to assist you and make you job easier, so it’s worth doing your research into where to invest. Now that the basis and function of your room is sorted out; you can focus on the design details and sentimental accessories that will bring your personality into the space (not to mention making it Instagram and Pinterest worthy). Family photos and your kid’s artwork are the perfect way to adorn the wall and are great for popping into frames beside your laptop on your desk. Details like vintage lamps and wall lights will make more characterful additions to the office, especially if you live in a period property. Have a little fun with details like lampshades, chair cushions, and rugs; these are the perfect chance to add a vibrant pattern and some bright hues to the room which isn’t as permanent as your paint choices. 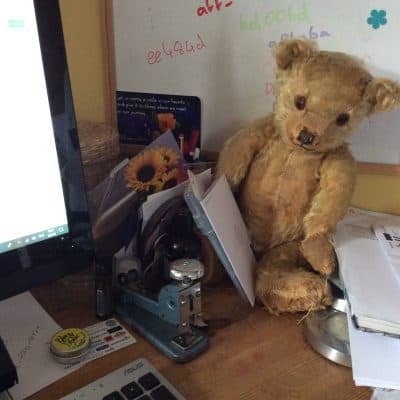 I have an old teddy, my trusty Gin and Tonic lip balm and a vintage stapler next to my computer on my desk….. what do you keep on yours?